A Northeastern US mineral legend, the black stemmed scepters of Herkimer are quite rare and despite hundreds of diggers toiling in the hard Dolomite only a few are found every few years. From a recent exceptional pocket this is a perfect example with no damage (extra rare) and doubly terminated (crudely) which is almost unheard of. The black stem is partly deep smoky brown with a few tiny areas of transparency. The top is sharp and glassy and also has dark inclusions some of which are brightly fluorescent. A fine small example of this most uncommon of Herkimer Diamond Quartz! 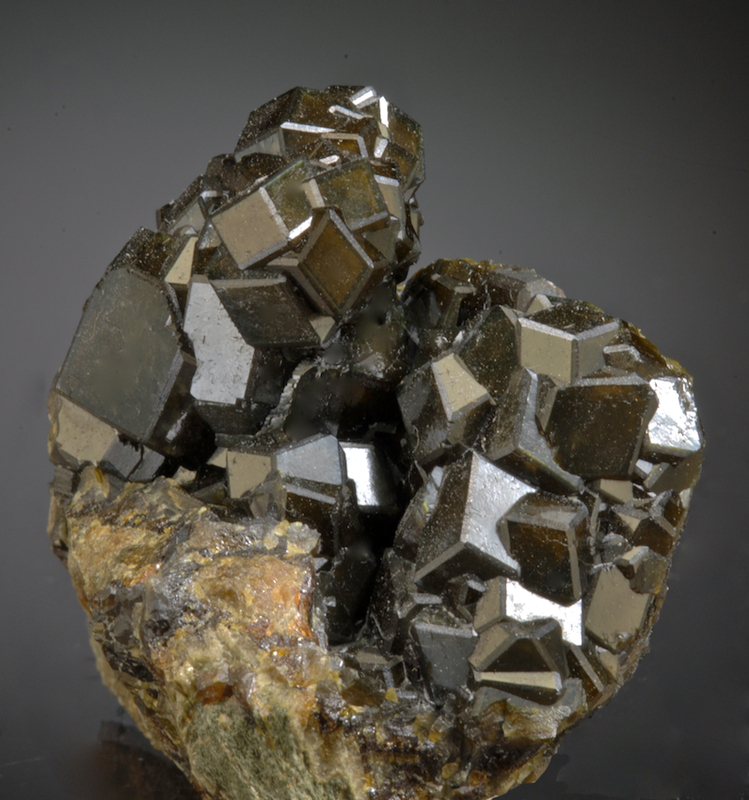 A quite rare mineral not often seen for sale in esthetic specimens, this is a fine and rich specimen of Fluellite. 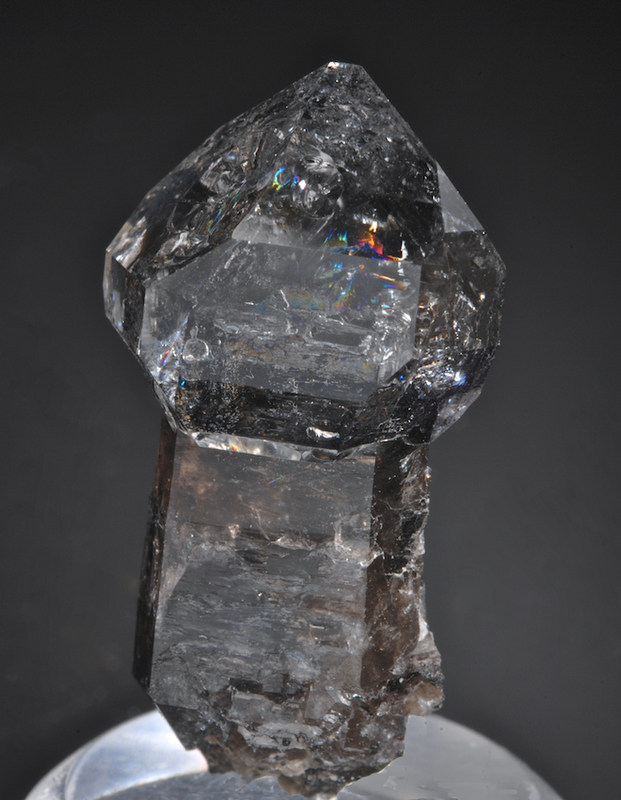 The crystals are sharp, transparent and well formed colorless although a few have a slight yellow tinge. Balls of greenish Wavellite are present and a few other small needle crystals probably Minyulite but not verified. 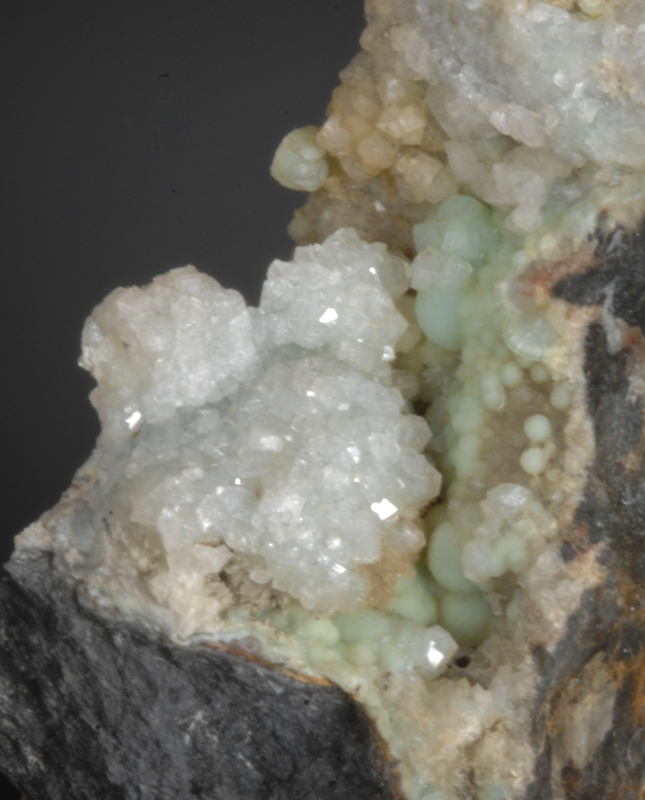 the crystals are in fine condition being protected in the central vug of this specimen. 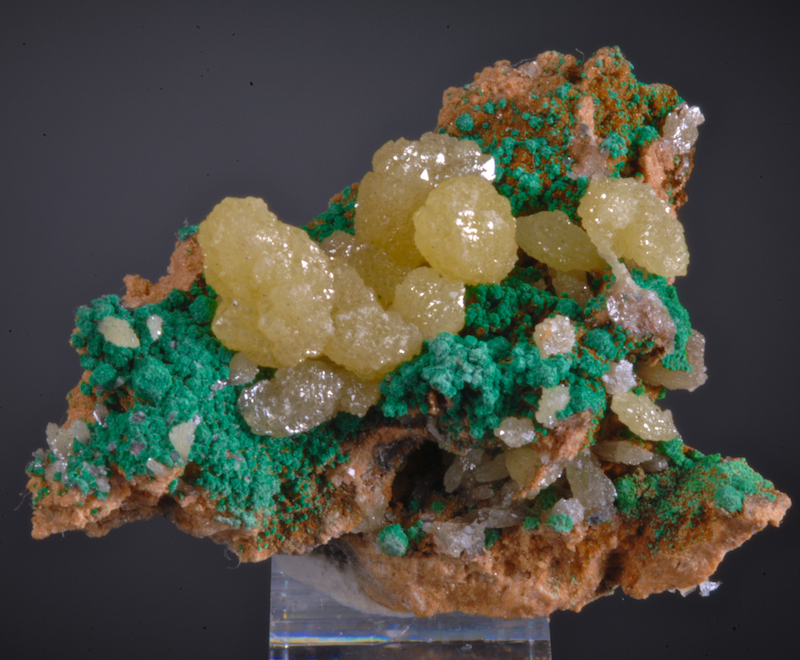 Adamite (yellow, non cuprian) with Malachite, Rosasite etc. 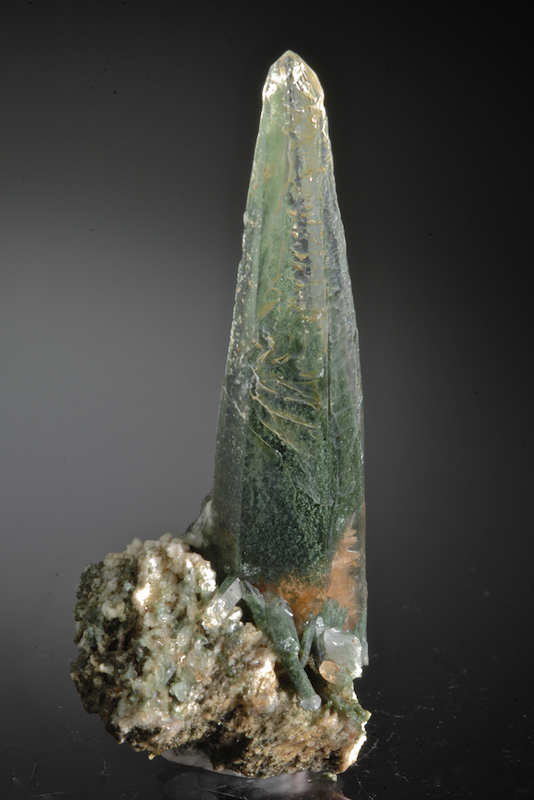 A rare yet quite pretty Tsumeb specimen, Adamite that is not the usual Cuprian (green) variety. The wheat sheaf type crystal clusters are lemon yellow, contrasting with Malachite balls some with a tinge of Rosasite. In fine condition, no damage at all by naked eye but with 20X magnification some very tiny areas of chipping can be found, virtually perfect. 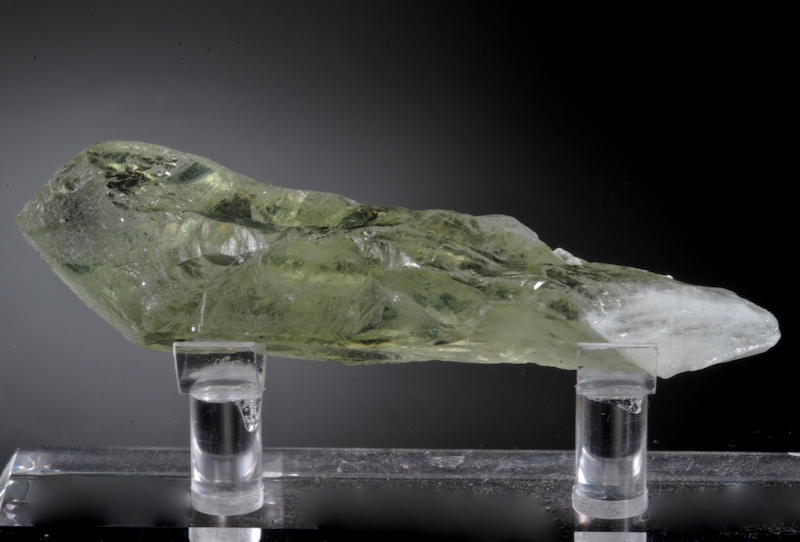 A very odd, beautiful and choice gem Beryl that reminds of the famed Ukrainian Heliodore, yet this is an Erongo specimen. In fine condition, all sides of this crystal are stepped and etched with complex, faceted faces. Close to 100 percent facetable gem grade transparency and 44 grams of green to yellowish color, like a midpoint between Aquamarine and Heliodore. We recently (2017) obtained this in Namibia where it was the best and largest of a single pocket. So far there seems to be no more. Doubly terminated (crudely) and in our experience, unique. An American classic, sharp Fluorite with excellent color and form from the Minerva #1. Complex cubic stepping and hoppers on several faces and a few Chalcopyrite crystals add a nice accent. The Fluorite cubes are very sharp, in fine condition, colorful and translucent to transparent. Looks great from several angles and with backlighting is really dramatic. The photos here are NOT backlit so it looks as it will in a typical display without special lighting. Sadly such quality Illinois Fluorites are fast becoming rare and expensive. No damage except on the underside where it was attached, this is choice and clean on all display faces. 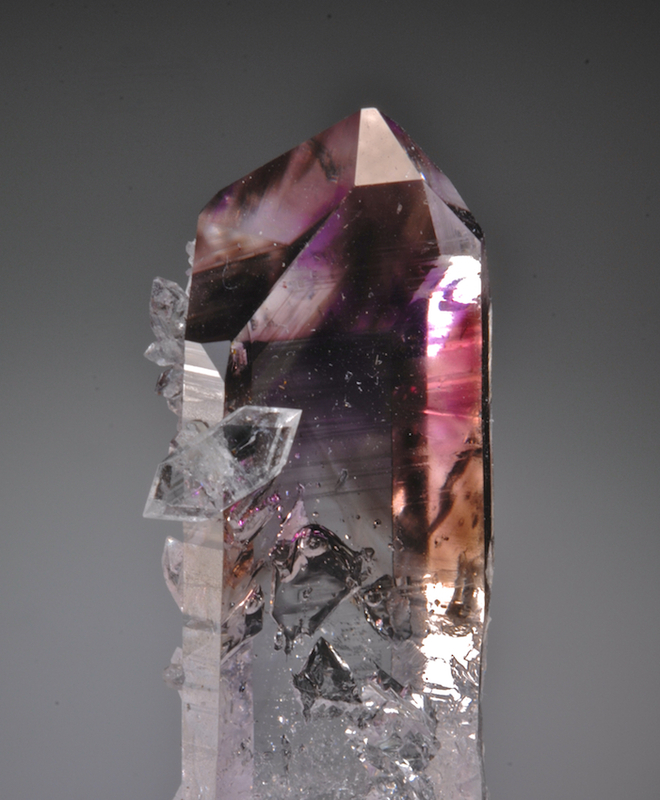 A fine and unusual Brandburg type amethyst crystal in perfect condition, with the very rare addition of Apophyllite crystals on some faces. Classic and esthetic, this is the best example I have seen of this uncommon association. The Apophyllite is gem clear and sharp, most are doubly terminated and all are very lustrous. In the Quartz, movable internal bubbles (enhydro) are a nice bonus. The Goboboseb region has produced lots of Amethysts but the quality, esthetics, condition and the Apophyllites make this one stand out from the crowd. Choice. A bright, sharp and lustrous Garnet cluster from the early finds at Huanggang. In fine condition the individual Andradites are up to 1.5 CM though most are a bit smaller. The color is a deep mahogany brown that can look nearly black in some light. A choice small specimen from the now famous Inner Mongolian mineral belt. 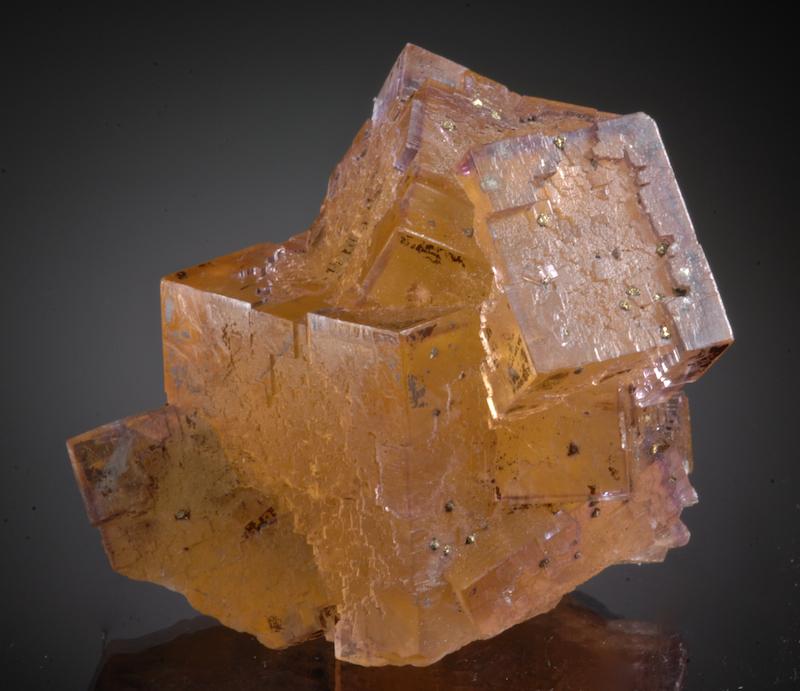 A wild an complex Quartz that is both attractive and exotic. Very striking green phantom zones in an otherwise perfectly clear crystal. A transparent window near the bottom of the prism show the inner core loaded with golden and red Rutile needles. The exterior of the quartz has some bizzare growth structures and striations that are not typical at all. The termination also shows a hint of a scepter. The main prism is on a crystallized matrix and undamaged. From early finds at Ganesh Himal, a very fine "Himalayan" type quartz with unique features and strong display esthetics.